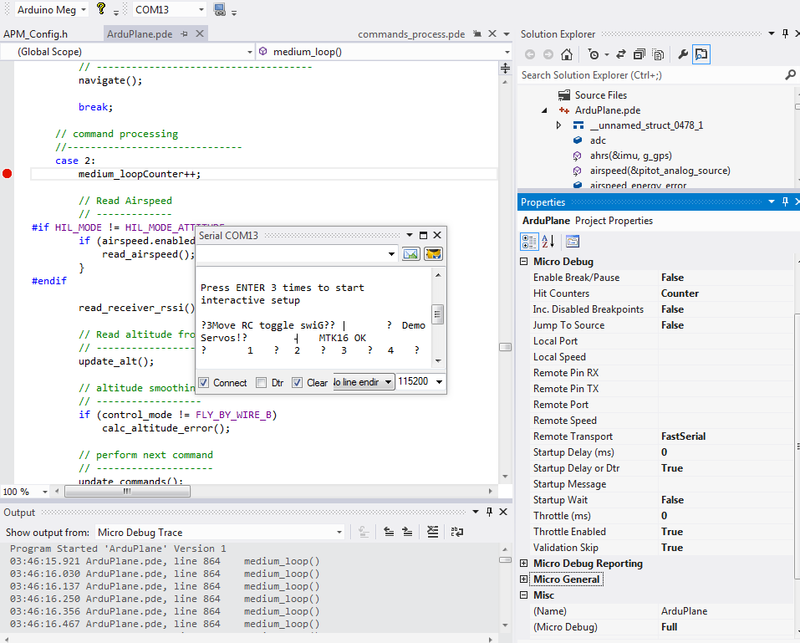 Visual Studio is currently the only IDE capable of debugging any Arduino project and is also aware of the special APM Serial communications system called FastSerial. Debugging a drone project requires functionality that exceeds what a normal windows/linux debugger can provide. For example, setting a debug trace and reporting message in a fast loop would normally produce too many messages to be of any use. 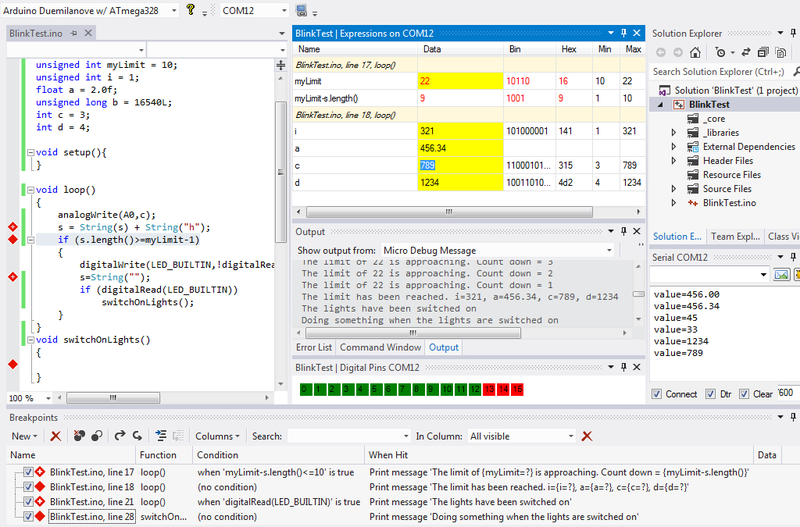 The Arduino debugger in Visual Studio allows TracePoints (or BreakPoints) to be conditional based upon any arduino code (as would be expected by any serious debugger) but it also goes one step further by allowing messages to be limited to any specified rate such as 1 per second. Another important feature of the Visual Studio debugger for drone projects is the ability to allow variables to be altered without the need for the program being debugged to stop execution (break). The VS debugger has a powerful feature that automatically queues requests to alter variables allowing the request to be processed when the code reaches the specified execution point. Looks like a great product with a great potential for improving the quality of complex Arduino-based s/w such as ACM! Yip, this is brilliant. Will download the plug-in and give it a go - thanks for the info. It is not easy to debug real time programs - when you start looking at multi threaded apps that adjust global variables then it becomes a formula for disaster if you have a debugger stopping the process(not that using globals is a good idea). Log files seems like the most feasable way for real time apps, but it is sssssooooo painfull to work through a debug log. Do arduino use multiple threads or is it strictly bound to the calls from the main loop and subloops befined in that. Does this tool have profiler/performance monitor? I just love this debugger!